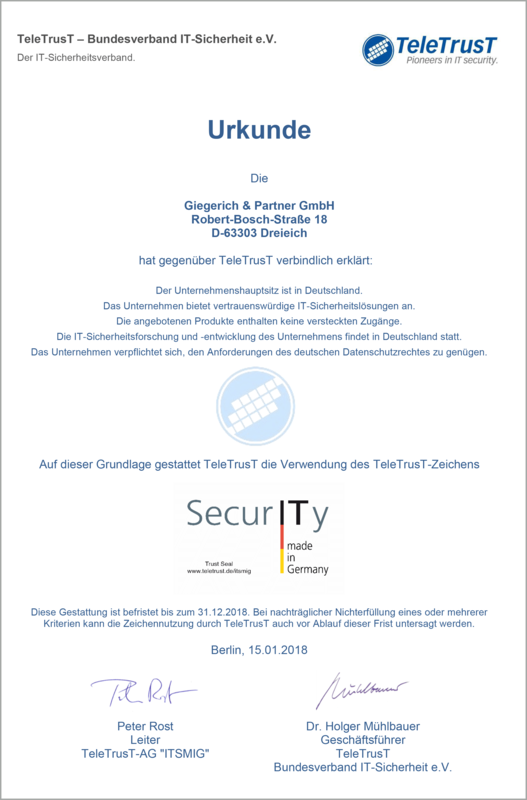 “ITSMIG” (“IT Security made in Germany”) has been established originally 2005 by the German Federal Ministries of the Interior and of Economics and Technology as well as by representatives of the German IT security industry. As a result of mutual consultations ITSMIG was 2011 connected to TeleTrusT. 1. The company is headquartered in Germany. 2. The company offers trustworthy IT security solutions. 3. No solutions that contain non-declared backdoors are offered. 4. All the company’s IT security research and development are conducted in Germany. 5. The company is compliant with German data protection law.